CAUTION: people with sensitive skin can get reactions from touching the plant. Scarlet pimpernel, commonly known as blue-scarlet pimpernel, red pimpernel, red chickweed, poorman's barometer, poor man's weather-glass, shepherd's weather glass or shepherd's clock, is a low-growing prostrate annual plant. This plant is in the primrose family (Primulaceae). It does not compete well so it favours places where the soil is almost free of other plants. Scarlet pimpernel’s scientific name, ‘adornment of the fields’, is very fitting, and it’s an interesting and not-so-common plant. According to some European herbalists the red-flowered form is especially good for men, while the blue-flowered plants are more suited to women. 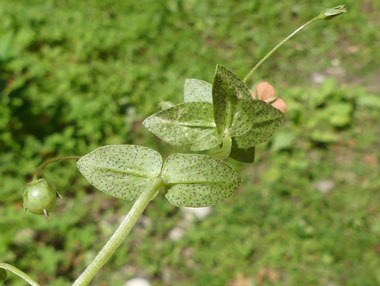 Distinguishing Features: Many people will misidentify this plant as chickweed if the flower is not present. (The taste will definitely tell you it is not chickweed as chickweed is very pleasant tasting.) 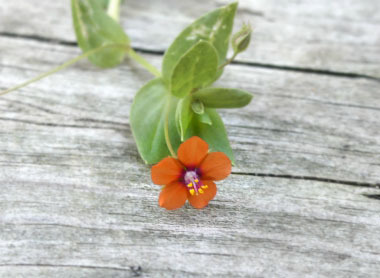 Scarlet pimpernel is a low-growing annual wildflower that has square stems, and its oval pointed leaves are black-dotted underneath.The flowers are rarely more than 10 to 12 mm across and have five sepals (commonly referred to as the petals). It's distinct orange colour makes it easy to spot if it is in bloom. Occasionally you may come across the blue-petalled variant (Anagallis cerulea) of this petite wildflower, especially in Europe. Flowers: The orange flower appears on the leaf axils and occur individually on long shafts. 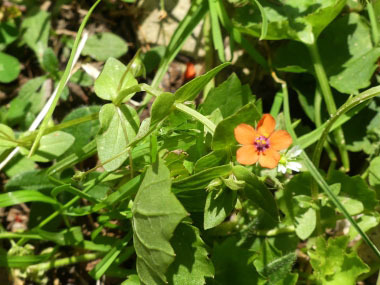 Scarlet pimpernel typically blooms from June to September (depending on geographical location). The flowers are only open for few hours during the day, and only if there is sun. It has five petals and five stamens, each standing exactly opposite to a leaf. Upon the stamens are a number of delicate, violet hairs, which seem to serve as a bait to insects. Flowers are usually in axillary pairs. 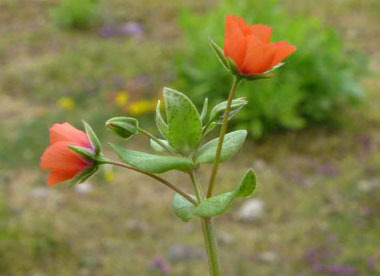 Fields of Nutrition has medicinal benefits and vitamin/mineral content of Scarlet Pimpernel. Leaves: Leaves grow opposite and are stalkless. The blade is ovate, elliptic, has a hairy underside, is darkly spotted, with whitish, densely-haired, entire margins. Leaves have black dots underneath. 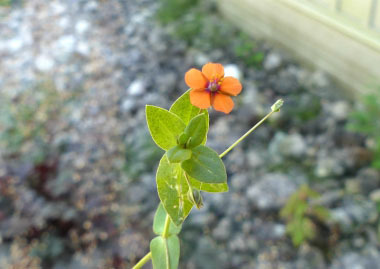 Height: Scarlet pimpernel grows anywhere from 3 to 40 cm (1.2–15 “). The stalk in limp but can also be erect; it is highly branched from base. Habitat: Scarlet pimpernel is most likely native to the Mediterranean region, but has now been introduced to most parts of the world with temperate climate. It prefers relatively sandy soil and does not tolerate shade very well. The species spreads by agricultural farming and occurs primarily as a weed in farmlands, fields and gardens. Although it prefers cultivated land it can also be found growing in fallow land, along roadsides and seashores. Edible parts: Leaves are edible (although not that great tasting). Do not consume large quantities.